The church: St Peter's, Manhattan, New York. Denomination: Evangelical Lutheran Church in America, Metropolitan New York Synod. 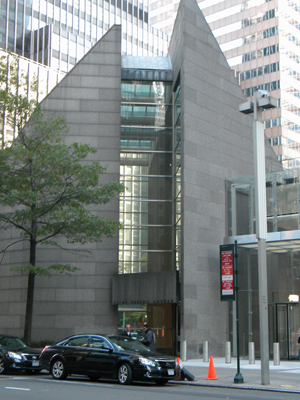 The building: A strikingly modern structure, described on the parish's webpage as "a bold architectural statement" and "a counterthrust to the glossy opulence of Park Avenue." The sanctuary area is simply adorned with a wooden altar, pulpit, and three chairs for celebrant, deacon, and subdeacon. 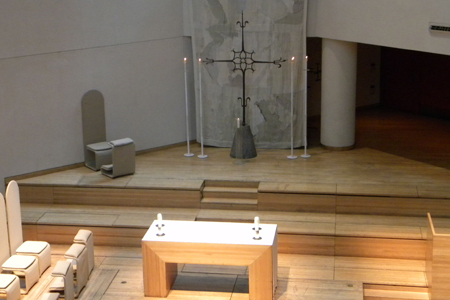 Above the cross behind the altar are windows; the worship space is below ground level and the windows give a view to the streets of New York above. The church: There is an extraordinary breadth to the activities of this congregation. They are quite well known for their music program, both classical and jazz, with a Tuesday evening concert series, a Sunday evening jazz service, and a "Midtown Jazz at Midday" concert series on Wednesdays at 1.00pm. There are also a wide range of educational activities (children's Sunday school, adult forum, a book discussion group), social justice outreaches (including a ministry to the homeless and an AIDS ministry), and liturgical ministries (including communion bread bakers). They also have a 24-year tradition of sharing an annual service of remembrance of the Holocaust (Yom HaShoah) with Central Synagogue. There are two English masses and one Spanish mass each Sunday, as well as an afternoon jazz service that is either mass or vespers. There are daily masses Monday through Friday (with a second celebration on Wednesday evenings). In addition to their senior pastor, there are four associate or assistant pastors, including a pastor to the international community and a pastor for pastoral counseling. Another of their associate pastors is an African-American woman ordained in the United Church of Christ, a full-communion partner of the ELCA. The neighborhood: St Peter's is on Lexington Avenue at East 54th Street, a mixed use section of midtown Manhattan. It is surrounded by hotels, condominiums, banks, restaurants, etc. This is a highly affluent area of New York, not far from the United Nations. The cast: The Revd Jared R. Stahler, associate pastor, presided. The Revd Jonathan Linman, Assistant to the Bishop, Metropolitan New York Synod, was the homilist. Thomas Schmidt, D.Mus., director of music, was organist. A guest choir from the Nightingale-Bamford School, the Gospel Girls, was directed by Roosevelt André Credit. The date & time: Sunday, November 8, 2009, 11.00am. About 80 per cent full. No one welcomed us, but only because we arrived early; as we are not familiar with Manhattan, we had allowed more time than necessary to get to St Peter's. The Gospel Girls were rehearsing, so Materfamilias and I helped ourselves to a hymnal and service leaflet, and listened to their rehearsal. I noticed that a group of ushers showed up eventually, and warmly welcomed worshippers as they arrived. Extremely comfortable cushioned pews. There were fold-down kneelers under the pews in front of us, but there was no kneeling during the service. A bit of chatter. We were sitting near the area where the choirs gathered before processing in, and there seemed to be some discussion with the visiting choir about how they would process in. Evangelical Lutheran Worship, a combination service book and hymnal that was "commended for use in the Evangelical Lutheran Church in America" in 2006, and a printed service leaflet that enabled us to follow a fairly elaborate liturgy without difficulty. A two-manual, 42-rank pipe organ, an opus of Johannes Klais Orgelbau GmbH & Co. of Bonn, Germany. And piano, electric bass, and drum set. For the most part the former accompanied the service music and hymnody, and the latter accompanied the Gospel Girls. But they all played together, to great effect, on the final hymn, "Amazing Grace." Roosevelt André Credit added an occasional shake of the tambourine. As I noted above, there are open windows through which one looks up to a view of the streets of New York behind the striking sanctuary cross. During the eucharistic prayer, a fellow walking by stopped to peer in. Nothing wrong with that, of course, but for those of us used to a more traditional worship space, it was distracting, particularly at that point in the service. I suspect the regular congregants would think nothing of it. A formal, evangelical-catholic liturgy, but without a hint of stuffiness or antiquarianism. The liturgy began with the blessing of water and sprinkling rite; celebrant, liturgical deacon and subdeacon were vested in chasuble, dalmatic and tunicle, respectively. Two acolytes brought out candles and stood on either side of the altar during the eucharistic prayer. And most of the service music on this particular Sunday was Gregorian chant (Setting Five in ELW). The Gospel Girls provided a marvelous complement to all of this with their three musical numbers, and many in the congregation clapped along in accompaniment to their singing. 7  Pastor Linman is a natural and gifted public speaker. He began by noting that although he had participated in the life of this congregation in various capacities before, this was his first opportunity to preach here. His preparation was obvious, and led me to think of this gospel text in a way I had not before. If I were grading on the first 15 minutes of his sermon, he would get a solid 10. But the last six or seven minutes really added nothing to what he had already said. Quoting from the gospel for the day (Mark 12:38-44, the story of the widow's mite), he admonished: "Beware of the scribes who walk around in long robes." Whereupon he stepped out from behind the pulpit, giving the congregation a view of his long robe, saying "Ouch!" He noted the perils of clericalism that Jesus was talking about in the gospel. But he went on to say that this particular passage is not about the perils of privilege, or the merits of overabundant giving – that's too easy. It is, rather a story about faith – the widow exhibited a trust in that which is ultimate, transcendent, and eternal. The widow is willing to enact a free fall into God's grace. Much. I was delighted to see how beautifully Gregorian chant and gospel could complement each other in a traditional liturgical setting. I was quite impressed by Dr Schmidt's sensitive organ accompaniments, particularly in the Gregorian mass setting. Pastor Stahler is a trained musician, and chanted his parts of the service beautifully. And the Gospel Girls were an absolute delight. Nothing at St Peter's is "hellish," but a 15-minute sermon would have been fine by me. And I had not a clue as to who was leading the intercessions – all I heard was a disembodied voice coming through the loudspeakers. We remained in our pews after the final hymn, as did a good portion of the congregation, for one last piece of music by the Gospel Girls. That, in turn, was followed by a brief improvisation by the trio which had accompanied them. The congregation applauded, and we all dutifully made our way to the exit, where both celebrant and homilist were waiting to greet us. I had a brief conversation with the folks in line ahead of us, and was able to ask Pastor Stahler a couple of questions about the jazz service later that afternoon. St Peter's doesn't do an "after-service coffee!" It's a full-fledged, sit-down lunch (on this particular Sunday, the menu included a chicken-macaroni casserole, salad, bread, cake for dessert, and copious amounts of wine). A similar meal is served after the 5.00pm jazz service. The liturgy had been long – about an hour and forty minutes – and Materfamilias and I did not feel that we had the time to stay for a meal. But the next time we are in New York for a Sunday, I think we'll just plan on spending the day at St Peter's: adult forum, mass, brunch, book discussion club, jazz vespers, and dinner. 10  The combination of a strong liturgical tradition and jazz is an irresistible draw for me. Materfamilias, a Roman Catholic, seemed quite comfortable with the liturgy at St Peter's. When combined with the friendliness of the congregation, the commitment to social justice, and the diversity of the community, it's a no-brainer. The young (80-ish) lady two pews in front us, enthusiastically clapping to the sounds of the Gospel Girls.